The survey ... will allow for astronomers to use the globular cluster field to map the distribution of matter and dark matter in the Coma galaxy cluster, which holds over 1,000 galaxies that are packed together. It also has large number of globular cluster of stars. NGC 1818. Photo (from 1998): HST. Almost certainly, yes. Because we expect practically all - or maybe all! - globular clusters to be made up of very old stars. NGC 1818 is a young rich star cluster in the Large Magellanic Cloud. It is expected it will become a globular cluster, but is only about 25 million years old while almost all known globular clusters formed billions of years ago. Chris Peterson, who often makes inputs here at Starship Asterisk* would probably protest and say that NGC 1818 is not a globular cluster and will never become one, because it formed by another mechanism than "true" globular clusters like, for example, 47 Tucanae. Also, NGC 1818 is not at all as rich in stars as most globular clusters in the Milky Way, and then we must remember that clusters always lose members over time, so the globulars of the Milky Way were even richer in their youth than they are now. NGC 6946 with giant cluster. 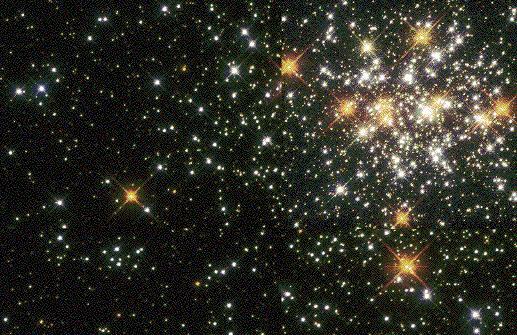 Giant cluster in NGC 6946. Photo: HST. On the PC image you can see an extremely bright young star cluster (...) with an estimated mass of about 1 million solar masses and an age of about 15 million years. 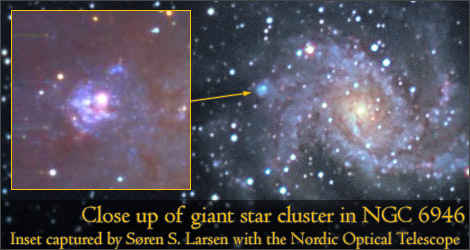 If it is true that the mass of the giant young cluster in NGC 6946 is about a million solar masses, then it is about twice as massive as the extremely young R136 in the Large Magellanic Cloud. My point is that very young populous clusters are still forming. We even have one in our own galaxy, NGC 3603. But populous young clusters form most easily in galaxies with a lot of ongoing star formation, like the Large Magellanic Cloud. NGC 6946 is clearly a galaxy that has seen a lot of star formation in the very recent past. The Milky Way is not a starburst galaxy by any means, but NGC 3603 is classified as a starburst region in our galaxy. Steve Mandel/Adam Block /NOAO /AURA /NSF. There really are pockets of star formation in galaxies that are for the most part red and dead. Personally I really, really wonder about the nature of that one prominent blue knot in the mostly non-starforming barred spiral galaxy, M58, in the Virgo Cluster. As for the Coma Cluster, it is chock full of elliptical galaxies with no star formation in them at all. Admittedly there are a few spirals there, too. 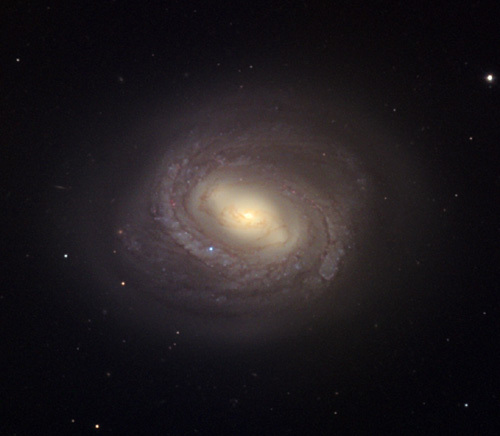 NGC 4921 is known for its "anemic" nature, with its dust and spiral arms dissolving into nothingness, so no massive clusters are expected from that galaxy. NGC 4911 has a bit more "oomph" in it, and Wikipedia claims it has a starburst ring, so there might possibly be a rich young populous cluster somewhere in that galaxy. But apart from something that might be inside NGC 4911, we have every reason to believe that all the huge rich clusters that are found in the Coma Cluster are remnants of that cluster's glory days of star formation in the very distant past.